Click on the image above to visit postcard images of Muskegon as the city appeared back during Buster Keaton's time in town. They were different times - there is no question about that. Visitors to Muskegon over the years have seen many changes. Keaton himself noted this when he returned to town with his wife, Eleanor, for a visit back in 1949. Check out this week's Muskegon Chronicle "Looking Back" feature for a view of another section of the city from Buster's era that doesn't show up in postcards. This week’s retrospective is from 1917 when, prodded by local civic organizations as well as The Chronicle, the prosecuting attorney moved to shut down Muskegon’s red light district. Photo courtesy Lakeshore Museum Center. The Ashley Furman house was the type of “rooming house” targeted by the city’s 1917 crackdown on vice. Located at Market and Terrace, the house was built in the 1860s and served as a brothel during the lumber era. It was razed in 1939. The blow that means the end of licensed vice in Muskegon was struck yesterday afternoon by Prosecuting Attorney Christian A. Broek when he filed 12 separate and distinct bills for injunction in circuit court to put out of business every house operating in the so-called “sawdust” district. The Hattie Dolly rooming house, 147 W. Western Avenue, that came so prominently before the public eye as a result of a police raid last fall, is also included. Mayor Arnt Ellifson had given his approval of the prosecuting attorney’s move. The mayor pledged The Chronicle, the pastors of the city, the civic department of the Muskegon Woman’s Club, the W.C.T.U. and others some time ago, that, if re-elected, he would bar organized vice from Muskegon. The prosecutor brings his action under the well-known injunction and abatement law, passed by the 1915 state legislature, which authorizes public officials to close any house whose reputation as a resort of ill-fame has become generally established. Absolute proof that the house is being run as a house of ill-fame is not needed under this law. Muskegon’s city fathers attempted to turn the once-rowdy Lumber Queen into a respectable matron when they moved to shut down the red light district in 1917. 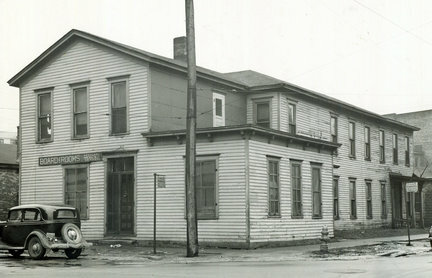 At the height of the lumber era, an estimated 85 saloons lined Ottawa Street, most with rooms upstairs for prostitutes. In 1887, the local prostitutes — including Big Delia and Spanish Lou — joined in the city’s Fourth of July celebration, setting up a bandstand and hiring a Milwaukee band to entertain “something like a thousand” lumberjacks. The city turned to manufacturing after the timber was exhausted, and aspirations to respectability came with a more settled workforce. Still, a much smaller red light district lingered on in the city long after the loggers headed west. Camouflaged as boarding houses, the brothels relocated a few blocks west from the infamous Sawdust Flats, close to where the new Central Fire Station, 770 Terrace, now stands. Although Congress passed anti-prostitution legislation in 1910 and the state followed in 1915, it took until 1917 for Muskegon to shut down its downtown brothels. The resorts which the prosecutor seeks to close by his 12 bills for injunctions are: Rose Snow, 11 Spring Street; May Cline, 64 E. Webster Avenue; Ethel Ward, 26 Spring Street; Jean Ardell, 28 Spring Street; Georgia Steiner, 34 Spring Street; Rose Fox, 89 E. Webster Avenue; Myrtle Reed, 91 E. Webster Avenue; Myrtle Reed, 95 E. Webster Avenue; Myrtle Reed, 101 E. Webster Avenue; Carrie Clark, 103 E. Webster Avenue; Thelma Williams, 105 E. Webster Avenue; and, Hattie Dolly, 147 W. Western Avenue. The hearing on the prosecutor’s requests for injunctions closing these houses will be held 10 a.m. Monday in the circuit court. Whether the proprietors of the houses will fight the action is not yet known. They generally don’t. The actions are not criminal prosecutions. Proprietors and inmates of the houses will not be thrown into jail. The resorts will be merely put out of business, and the sheriff will be authorized to clean out the houses and get rid of the furniture and everything else in them. Mr. Broek planned this action immediately after his election. He told The Chronicle so before he took office and told the mayor Jan. 4. His only reason he has not taken action before this is because he was unwilling to give it a political tinge by springing it just before the spring election. “Upon my coming into office as prosecuting attorney, Mr. Jackson, the assistant prosecutor and myself went thoroughly over the situation with regard to the red light district and we both agreed that the time had come when the law passed in 1915, Act. No. 272, providing for the abating and enjoining of houses of ill fame as nuisances, should be enforced. "We thereupon conferred with the mayor, Mr. Ellifson, on Jan. 4, last, and pointed out to him the provisions of this law. He agreed that the segregated district should be wiped out, but asked us to defer action at that time because of the fact that the police were busy rooting out gambling and the slot machines.